Let’s take a brief foray into neuroscience and look at some of the interesting things that happen in the human brain when we are told stories. They include neural coupling, which is when the brain essentially turns the storyteller’s experience into our own experience. A remarkable process called mirroring, where our brain activity begins to mimic that of the storyteller’s, also occurs. Dopamine, a neurotransmitter that has been found to aid memory retention, is released. And the cortex, the part of our brain associated with thought and action, is activated more than it would be if we were just processing facts. That explains why stories are such an incredibly powerful tool for email marketers to use to connect with customers. You don’t have to be a fiction writer to be an effective storytelling email-marketer. There are few stories more compelling to your potential customer than stories about – or from – your current customers. Let their experiences tell your story for you. If you are promoting a special offer, explain the story behind it. Why not share that that the offer is designed to mark an anniversary, commemorate a holiday or move excess inventory? Use a story to explain to your customers why they are hearing from you. 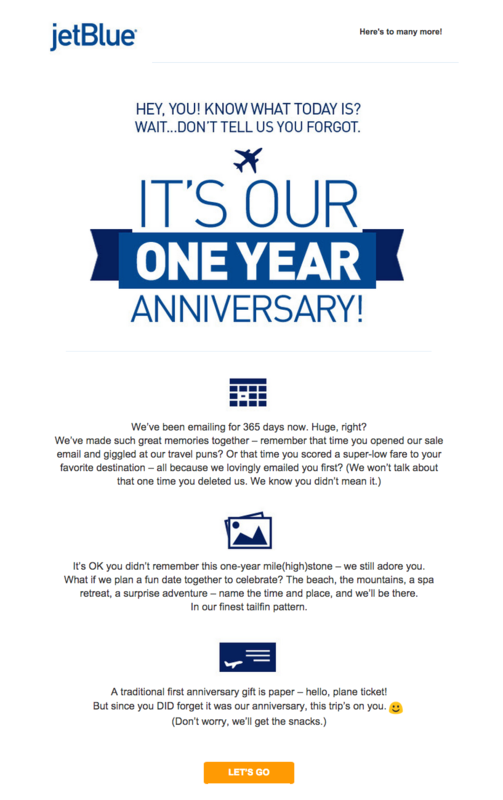 JetBlue pegged this email to a “very special” anniversary that likely otherwise would have gone unnoticed by the recipient – the one-year anniversary of their email “relationship.” It’s a great example of “reason why” storytelling. These are the stories behind your company or product that can serve to differentiate you from your competition. They can be about what inspired the founding of the company or about the gaps you see that you are trying to fill. Share your aspirations. How is your company going to change your industry – or even the world? How are you going to provide better service? How do your products make people’s lives better? Your stories don’t always have to be directly related to your products. They can even be personal anecdotes. Sometimes telling a story outside the realm of your business can help humanize your brand and help build engagement. This entry was posted in Email Marketing and tagged email content, storytelling on August 17, 2016 by Kristen Dunleavy.